Does your cat like to chew on grass-like houseplants? Does your dog like to snack on “people food”? Do you find that your pet bird likes being in the kitchen with you? Unfortunately, all of these situations and many more can set the stage for poisoning, injuring, or even killing a pet. Here are some tips on protecting your pet against common hazards in the house and garden. Let’s start with the garden. Water features are a popular addition to many gardens and yards. However, dogs and cats should not be allowed near the ponds. They might lick up water that is contaminated with pond chemicals or fish food, and a puppy or kitten could drown. If you have fish in the pond, be aware of their safety, too. Excessive vegetation and debris in and on the pond can suffocate your fish – so can a layer of snow on top of an ice-covered pond. Make sure to clear out vegetation and thin pond plants to avoid this, and clear snow away from the top of ponds. Also, break a hole in the ice to give the fish oxygen. A good rule of thumb is to fence off a pond and any other water features, such as fountains. All animals are susceptible to heat stroke. Never shut an animal of any kind in a car on a hot day, even with windows cracked. It only takes a few minutes for the heat in the car to get to dangerous levels. Animals need access to shade, too – don’t keep a dog or cat in direct sunlight on hot summer days. 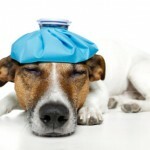 Animals with heat stroke might go into a stupor, vomit, pant excessively, or even go into a coma. Make sure your animal isn’t panting and fidgeting and acting uncomfortable – if it is, these are signs that heat stroke could come on quickly. Keep all house plants out of the reach of cats and dogs. Hanging plant pots are good for keeping plants up and out of animals’ reach. The only exception is “cat grass,” catnip, or other plants obtained from your vet or pet store that are specifically for cats. If you have a pet bird, make sure it does not have access to house plants. When your home is undergoing a major overhaul or even just some improvement, your pets will probably find the disruption stressful. Make sure your pets are out of the way of any handymen, contractors, or other workers. Pets can get injured easily or escape outdoors during home renovation. Temporary confinement in crates and cages, while unpleasant to some animals, are the best solution for keeping them out of harm’s way. With some basic awareness and a few precautions, you can keep your pets safe this summer and beyond.